Keeping it Crafty at the Beach! With the craft beer explosion happening all over the states, North Carolina is no exception! With that being said, Wilmington and our beaches are happy to boast about our own selection of fine breweries and taprooms that will have you celebrating Oktoberfest all over town! The first brewery to grace Pleasure Island is Good Hops Brewing just a bike ride away from the Beacon House Inn! Richard Jones, head brewer at Good Hops, was recently the recipient of the Epicurean Award in the category of best beverage for his Donna Pineapple Infused Pale Ale and his Bravehop Scotch Ale. Although Good Hops does not have a kitchen, they are carrying some goodies from the Veggie Wagon or you can feel free to bring along your own snacks. If you are just looking for beer to go-grab a growler and have it filled! On that note, if you are looking for more beer to go, you can also check out the Veggie Wagon in Carolina Beach. They are offering ten rotating taps exclusively from North Carolina breweries to fill your growler. A new local hot spot and one of our recent favorites on the Island is Riptide Taproom and Grill. The Riptide has thirty rotating beers on tap from breweries across America. The food is tasty and they keep the kitchen open until 2:00am. The search for late night food is over! People who have visited our area before may already be familiar with Front Street Brewery. They are Wilmington’s oldest microbrewery having been in business since 1995. They offer a full menu of hearty pub food along with a kid’s menu from 11:30am until midnight seven days a week. They offer daily brewery tours and beer tastings as well. Broomtail Craft Brewing-We recommend the Bucket List Blonde! 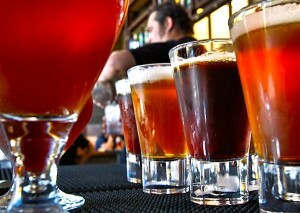 We are looking forward to the opening of a few more craft breweries in Wilmington as well. Ironclad Brewery, Fox and Crow Brewery, Waterline Brewing Company and of course the Port City Brew Bus that will “drive you to drink” to all of our best local brew pubs! So, we are certainly “keeping it crafty” in Wilmington! If craft beer is your thing, come on down and visit the Port City and Carolina Beach and taste some of the best! With Wilmington Beer Week just around the corner (October 11-17, 2014) now is the perfect time to head down to the beach! This entry was posted in Beacon house inn, Carolina Beach, Craft Beer, Fall Events, Growlers, Local and tagged carolina beach, craft beer, growlers, micro breweries, wilmington nc by admin. Bookmark the permalink.